Don’t let a hungry, pushy squirrel in your yard keep the birds from getting their dinner! While squirrels may be cute, they also have hearty appetites and may eat all the birdseed in your feeder. And that’s just not fair if you’re a hungry bird! This bird feeder is cleverly designed with adjustable weight settings that shut the feeding tray and keep squirrels and larger birds away. Because it holds over 9 lbs. 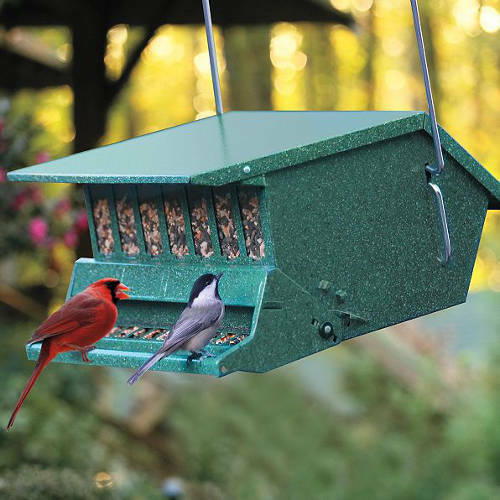 of seed, this squirrel-proof bird feeder doesn’t need to be refilled very often and features a Seed Saver Baffle that helps prevent seeds from going to waste. Not only is it easy to open and fill, it’s also made of chew-and rust-resistant metal, has a green powder-coated finish, and includes a hanger and pole-mounting bracket (pole isn’t included). This Squirrel-Proof Bird feeder is sure to become your birds’ best friend!